Playgroup is a great opportunity to form relationships with other families in the Glenfield community, over great coffee and fun play. Come along with your child and together, enjoy a morning of socialising and play. Children experience a variety of different experiences of play. It’s purpose is to provide opportunities for parents and caregivers to understand and explore play with their children in a safe environment. 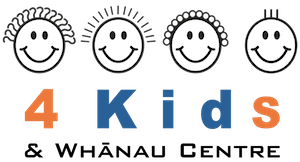 Playgroup is a parent led and facilitated by 4 Kids &amp; Whanau.